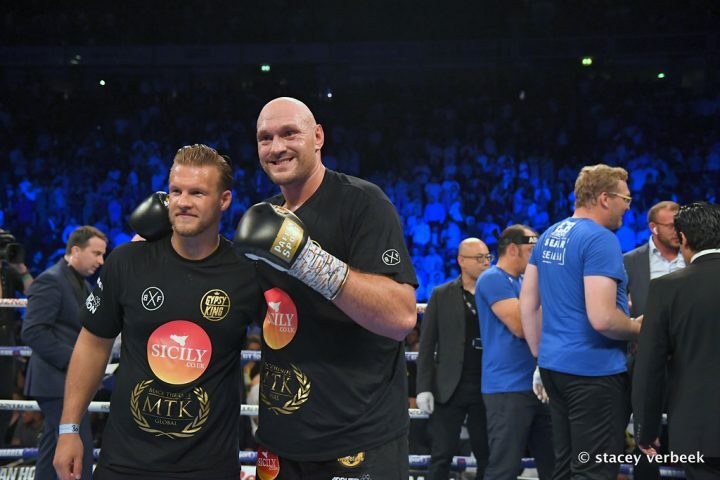 By Allan Fox: Former heavyweight champion Tyson Fury stopped Sefer Seferi in round 4 on Saturday night and afterwards promoter Frank Warren said that former WBC cruiserweight champion Tony Bellew could be next for Tyson by the end of the year. Fury vs. Bellew is going to be a mismatch just like Saturday’s Fury-Seferi fight was. Bellew is much too small to be competing with a giant heavyweight like the 6’9” Fury. Warren says Fury (26-0, 19 KOs) will be fighting on August 18 at Windsor Park in Belfast, Northern Ireland. That opponent is supposed to be a slight step up from Seferi, but it’s unknown how much of a step up. Warren points out that Fury still needs to lose weight and get sharper before he challenges for a world title. While Fury was speaking of wanting to fight for a world title this year, Warren points out that IBF/WBA heavyweight champion Anthony Joshua and WBC heavyweight champion Deontay Wilder are busy with fights. I don’t think it’s realistic for Fury to be thinking of fighting for a world title in 2018. He’d be better off challenging for a title fight next year, because he wants to get four fights under his belt before he fights for a title. After little action in the first two rounds tonight, Fury’s opponent Seferi, 39, bowed out after round 4 when the going got too tough for him. Fury was hitting Seferi with power shots to the head in round 3 and 4, and the fight was no longer competitive. It would have been better if Seferi had stuck it out gone out on his shield rather than quitting on his stool after the 4th, because it robbed the boxing fans of seeing a stoppage. ”On the 18th of August in Windsor Park in Belfast, that’s where he’ll be,” Fury’s promoter Frank Warren said. ”As I said, it’s a process getting the rust out. You can see he has a bit of weight to lose. He needs the rounds. We’ll just have to step up with opponents each time. I think the third or fourth fight, that’s where we’ll be with that. The name of the opponent is let’s find an opponent and keep getting that rust out of his system,” Warren said. Fury needs to transition into fighting heavyweights, because his goal is to fight the 6’6” Anthony Joshua and 6’7” Deontay Wilder. If Fury gets accustomed to fighting smaller cruiserweights, he’s going to be in shock when he gets inside the ring with Wilder or Joshua. Those guys have the height and reach to get to Fury’s chin, unlike the 6’0” Seferi. Tony Bellew, 6’3”, is a tall cruiserweight, but the fact of the matter is, he’s not a heavyweight. Bellew weighed just 210 lbs. for his last fight against David Haye on May 5th in London, England. If Fury’s weight stays at 276lbs, he’s going to outweigh Bellew by a huge amount of weight. Bellew’s high weigh for his pro career is 213 lbs. That’s too low for him to be competing against Fury. ”I’m very disappointed that Seferi retired in his corner,” Warren said. ”I’m sure everybody is. That’s what he did. At the end of the day, he needs rounds. He got four rounds under his belt. We’ll keep moving onward. The objective is to get him in contention to fight for a world title as soon as possible. First of all, I think Anthony Joshua is fighting Povetkin. I think that’s an open secret in boxing. I think that’s going on in September or October, so he won’t fight until next year. Wilder’s got a mandatory defense, so he’s not going to be available until next year. Tony Bellew, absolutely, we’d go for that by the end of the year,” Warren said. Fury vs. Bellew will interest UK boxing fans, but not the fans from elsewhere around the world. It would be better for Fury to pick out a good cruiserweight if he’s going to be combing that division for easy marks rather than sticking with heavyweights. There are better cruiserweights than Bellew, like Murat Gassiev and Oleksandr Usyk. Those guys would be better tests for Fury.